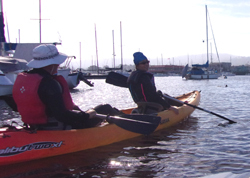 These are details of the annual De Anza College Outdoor Club (formerly Spring Break) spring quarter, (usually May) and fall quarter (usually October) Monterey Bay kayak day trip. The club will do the trip again 8 a.m. Sunday, May 12, 2019 (or if weather cancels that day, which is rare) 8 a.m. Sunday, May 19, 2019. Regular price for for a tour is $60. We will go for $27 for Outdoor Club members, $27 faculty, $30 other students. 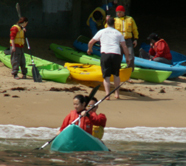 (A local recreation company charges $79- $99 for a kayaking lesson.) Outdoor Club membership is $15 for 365 days and members pay less for every event. Paperwork is ready for people to sign up for the May 2019 Monterey kayak trip. It will make signing up faster if you have read the details about the trip at this page AND the trip agreement in advance, (and you will be more likely to pass the required pre-trip quiz). You must sign up, in person, in advance and pay in advance. You do not have to know how to swim (even strong swimmers must wear a lifejacket), but if you don’t know how to swim, De Anza College has a class for you. 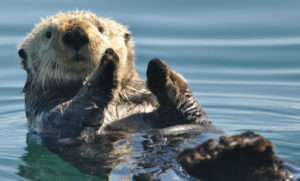 We’ve always seen otters, sea lions and seals. 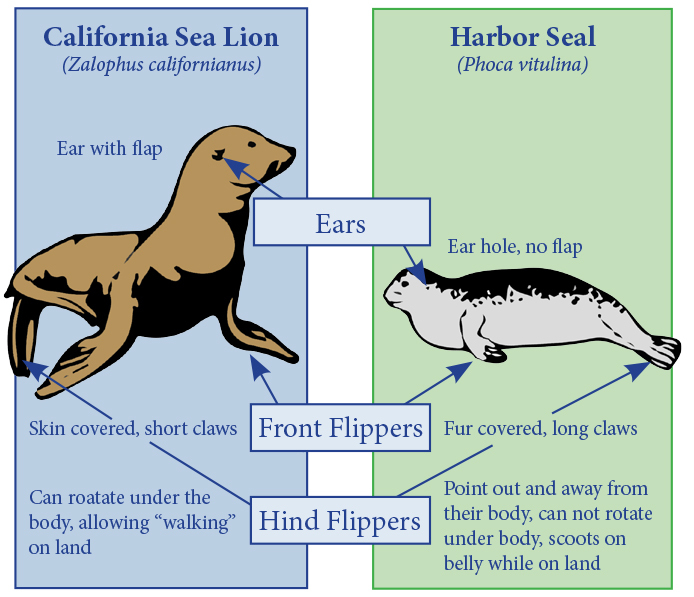 In Monterey bay, one way to tell the difference between harbor seals and sea lions is that the seals have spotted fur, no visible ears and crawl on their bellies; the sea lions have visible ears, can walk on land and bark. Bark loudly. It can be a half day or all day project. We meet in Monterey at 8 a.m. Figure a 1 1/2 to 2 hour drive. –No refunds unless the outfitter cancels both of our scheduled days. Interesting rainy weather does not cancel Outdoor Club events. People who arrive too late to be outfitted and launch with the group must pay again directly to the concessionaire (if there are any kayaks left) and they will be on their own, no longer a part of the college event. If you pay for the trip but do not do required paperwork you will not get a refund. If you pay for the trip but do not do required paperwork and do not attend the event, you will not get a refund. Thinking about joining this trip? You will have more fun and be safer if you understand all about this adventure. 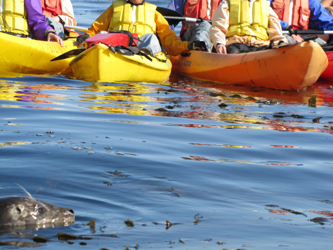 Please carefully read all this and then go to (sample trip agreement for Monterey kayaking) and read all of it, too. It could be wise to print this page so you have the driving directions and descriptions of what to bring. Trip participants are responsible for their own transportation. Transportation, including carpools and caravans, is on your own, the club does not arrange carpools or pay for gas, parking, lunch, etc. Please use Google maps to take a look at the location of 32 Cannery Row, Monterey, where you will see a map of the close-in vicinity. You could print that map and bring it with you. Scroll out a little to see a bit more of the streets. Many people take Highway 17 to Highway 1, then exit on Del Monte. After a number of blocks Del Monte bears right and changes its name to Lighthouse. Be in the right hand lane as you head through the tunnel and exit right on Foam (one way in this direction) and turn into the pay parking lot surrounded by Reeside, Foam and Cannery Row. This parking lot usually has lots of room at the early hour we start. The parking lot right next to where we launch from (on the Google map sometimes labeled as “best place to park” has lots of parking for only vehicles towing boat trailers, not as much for individual vehicles, so we suggest trying the (nearby) larger pay parking lot at the corner of Foam, Cannery Row and Reeside. There are numerous one way streets in the vicinity and if you miss the Foam exit after the tunnel you will wish you had a street map to find your way back. A street map of all of Monterey and down towards Carmel would also be a good idea to be able to get to Point Lobos State Park (south of Carmel) for the potential afternoon walk(s)/hike. Plan to park at the pay lot or (not recommended) get there extra, extra early, drop off passengers and drive around in the local neighborhood looking for non-pay parking. 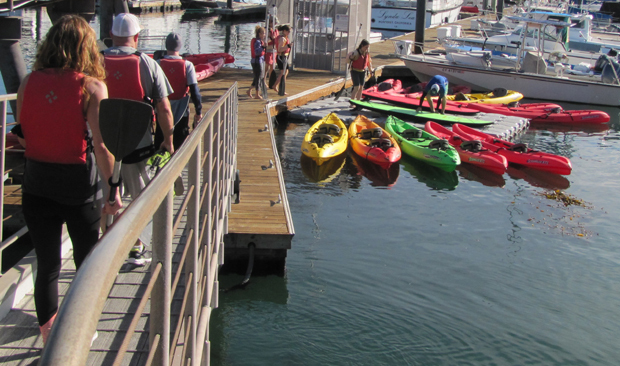 As you walk down Cannery Row from the parking lot look for the Coast Guard wharf where you will check in with us. The kayak company office is to the right of the huge boat launching ramp (picture below) on the first floor, the door faces out towards the harbor on the south-east corner of the building. It takes about a half hour to an hour (sometimes longer with a big group) to fill out releases, get gear issued (hey, your lifejacket must be fully zipped), do the paddling lesson and get everyone launched, depending on group size, but that does not mean you can be an hour late and expect to launch with us. 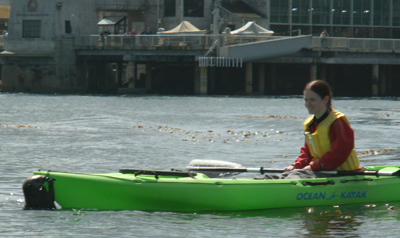 Kayaks to choose: — There are single (one person) kayaks, and tandem (two person) kayaks available. These are the kind of kayaks you sit on top of, not the kind you get your legs stuck in, so no special training or experience is required. People who know in advance who they would like to share a tandem with should sign up for one; if there are others available that day you can form partnerships when you get there. The club does not provide the kayaks, we rent them from the outfitter, so you do not have to transport one or transport a paddle/lifejacket (but if you have a favorite lifejacket, feel free to bring it). We launch on a floating dock in the placid waters of the harbor. We usually have someone experienced launch first, then let people who are least experienced launch next, so they have more time to practice paddling in the relatively flat water of the harbor before we go out towards the bay (see paddlers in the upper portion of launching photos below practicing). People climb into their kayak on the floating dock, and then are slid off into the water. We require that as we launch, everyone waits for all the group to launch. Some practice paddling around can be done while waiting for everyone to launch, but you must stay where we launched and in easy talking distance of the group. 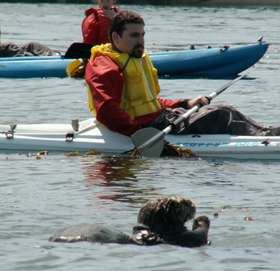 Smiling kayaker in the harbor who saw an otter surface eating a crab. When everyone is launched we try to do a group photo before anyone starts on their adventure. Everyone must stay in one fairly close together group as we go though all the rows of boats in the marina until we exit the marina. This usually means that experienced/fast paddlers must wait for others who are figuring out how to paddle to catch up. People sometimes start out paddling slowly, but fairly quickly catch on to how-to-do-it and then the big smiles appear on their faces. As we exit the marina we need to stay out of the way of large boats launching and returning. The photo below shows some of our group waiting for a large power boat to go by. Notice the breakwater with dozens (hundreds?) of sea lions we need to keep a distance from. This next photo is looking back at the harbor entrance, can you spot the dozens of sea lion heads and flippers in the water? We paddle out for one hour and everyone returns after that one hour. where we often do another group photo. We have noticed people on the balconies of the aquarium taking pictures of us. After paddling we bring our paddles back up the ramp to the rental shop and often help the kayak handlers bring some of the boats back up the ramp, then it’s time for lunch/snacks people brought and usually a quantity of snacks the club provides. We eat at picnic tables on the deck next to the boat launch ramp and watch people launch and take back in their fishing boats. (Some of them do not know how to back a boat trailer straight, but we try to not laugh too loudly at them.) By the time we return the wind comes up and there are often sailboats to watch, (occasionally racing) as well. There are restaurants and fast food places, but they take too long to have time for the potential optional afternoon hikes, so most people save restaurants for late afternoon / evening. Most of the group most years has formed carpools after we briefly eat and gone to Point Lobos State Reserve, 7 miles south of the kayak launch point, for a short walk (.8 mile) and a moderate hike (1.4 mile) along the most beautiful section of the California coast. Or you could bring bikes or roller blades and use the shoreline city trails made especially for pedestrians and bikes. The main trail runs at the edge of the parking lot. Some people stay for sunset on the beach. Asilomar Beach, around the peninsula from our kayak launch point, usually has enough parking along the road. —Bring: Chapstick, good waterproof sunscreen (remember to put some on top of your feet if you go barefoot or in rubber sandals, and on top of your legs if they are bare), water bottle (especially to be able to rinse salt water out of your mouth if you end up in the bay), sunglasses and croakies or other eyewear retainers, hat with a brim to keep sun out of your eyes, windbreaker, long sleeve polypropylene and/or other warm sweater, possibly a hooded rain jacket, warm knit hat, towel(s), change of clothes and shoes for afterwards in case you get wet. Bring hiking boots for the Point Lobos walk/hike if you prefer them to shoes. The club will probably bring binoculars for the hike, but if you have your own, bringing them is encouraged. Also bring a picnic lunch or money to get one, and money for your share of gas, etc. (no IOUs!). Money for the pay parking. Maybe dinner money, some people stay for the sunset. —Wear: -Lifejacket (provided and required: you must wear it all the time, and it must stay zipped), windbreaker and dry pants/splash suit (to protect your clothes, it looks like extra high waisted water-repellent pants) are all included in the rental cost. 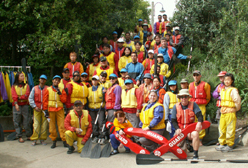 Wear loose clothes (swimsuit (or not) then polypropylene long johns with shorts on top – then as an outer layer the “dry pants/splash suit” the outfitter provides, and shirt and the windbreaker the outfitter supplies or swimsuit/spring wetsuit –people who wear full sized wetsuits have said they felt too warm). Be sure to take car keys and things out of your pockets so you won’t lose them in the bay. On your feet: Nothing (some risk of cut feet), neoprene booties, aquasocks, rubber sandals (the kind that can be velcroed to stay on your feet, not just flip-flops), or old tennis shoes that can get wet. Many trips no one falls out of their kayak, but your seat will at least get wet and some of the group gets soaked each year. There are a limited number of drybags to keep gear relatively safe, so grab one when you arrive. Lots of people bring binoculars or cameras, but there is some risk of getting them wet, or even losing them. Some people bring a waterproof disposable camera. farther away and walk. There will be an entrance fee at Point Lobos. –You will have to sign a release of liability for the rental company and for De Anza College. seals rest and birds nest or that far from otters playing or eating out in the water. If animals surface near us, or swim to, around or under us it’s okay, (such as in a lot of the pictures at this website) but when they surface near us we can’t paddle closer. Keep the noise down: Any unnecessary expenditure of energy can harm a feeding or resting bird or animal. Nesting birds may fly away from the nest exposing unprotected eggs and hatchlings to the sun’s heat or predators. Sleeping seals float at the surface and can look as though they are sick or dead. By signing up for the trip you agree to not disturb them by approaching closely or touching them. – – – Harassment is defined as any action that may cause an animal to deviate from its normal behavior. It is illegal and can unduly stress wildlife. – – – Other people will ignore these rules. – – – Please have more respect than they do. The concessionaire gives a kayak lesson before we go out. Please pay complete attention to it. It will include boundaries of where we are allowed to go and important safety considerations. The Coast Guard can charge $500 or more for a rescue. If you go where you’re not supposed to, and end up, for example, on the rocks and need a Coast Guard boat to come get you, De Anza will not pay for it, you will. The concessionaire usually tells us to stay in the area of the kelp beds, so we won’t go too far out from shore and get in the range of ships or fishing boats going to and from the marina. They tell us to not paddle too close in to shore, and have swells push us on to rocks. 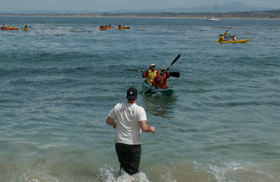 If the concessionaire gives us a limited distance/area to paddle in (sometimes only the 3/4 mile to the aquarium and no further), then people who want to get in a lot of paddling can get in a lot of visiting too, going back and forth from the front group to the slower paddlers at the rear. –You must agree to stay with the group, paddling in groups of at least four kayaks near enough to each other that you can talk to each other. This means fast paddlers may have to wait for others, and the next-to-slowest people will have to wait for the slowest. You should make it a point to stop and look around you frequently to be sure you do not separate yourself from the group. 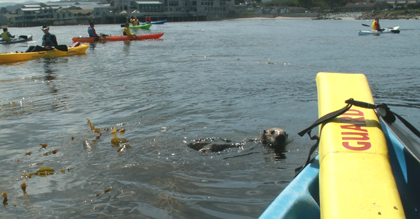 We all paddle to the part of the bay in front of the Monterey Bay aquarium and Hopkins Marine Station. Everyone must paddle at least 3/4 mile to the aquarium, so if you envision yourself just going out a few hundred yards and sitting around, don’t sign up for this trip, you must paddle at least that distance to stay with a group. Sometimes you have to paddle hard to keep the wind from pushing you where you don’t want to go. 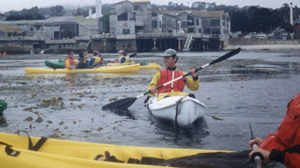 Paddling through the thicker parts of the kelp beds can be a workout. Sometimes we find bigger swells to paddle through. If you have doubts about your strength, share a tandem kayak. No one wants to tow you. –At launching, first ones out paddle around close in to the launch dock and wait for everyone else to launch. We will do a group photo and then start paddling. We will paddle out for one hour, and return as a group. Sometimes a group has to wait for anyone who falls out of their kayak to get back in and catch up to us (and assist them in the process by circling around their kayak and steadying it). If almost all of the group wants to head back early (the wind has come up or lunch seems to be calling people), then everyone must come back in, no one can stay out by themselves. After returning with a group and checking in, you are probably free to go out again on your own, but not as a club event, that is, De Anza will no longer have responsibility for you. The kayak outfitter may then require that you go in pairs. At any time the outfitter may decide the wind has come up too strong, and we will have to stop our trip, or you won’t be able to go out again in the afternoon, but this is rare. You will need to check with the kayak outfitter when we come back in. – The club advisor and or the outfitter will limit how far you can kayak. Often this becomes a social event and the entire group stays fairly close together, paddling as far as the Aquarium at a moderate pace, hanging out for awhile, then coming back. You must promise to keep paddling as necessary to keep up with the group, go at least as far as the Aquarium (about one mile) and finish the event, even if you get sore or tired. Towing you is too difficult and unfair to ask of others. — There are often lifeguards and/or people who have been on the trip before signed up for the trip. At least one usually volunteers to paddle with the slowest people. They were not hired to guard people; they volunteered to help as needed and lifeguards will bring rescue equipment (the red rescue tubes) in case it is needed. They are here to have fun, not watch the group closely, so remember the trip rule that you agree to stay with the group, paddling in groups of at least four kayaks near enough to each other that you can easily talk to each other. 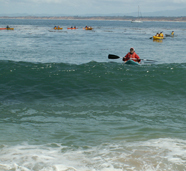 We’ve had a few people fall out of their kayaks in Monterey Bay. It’s okay, because they were wearing fully zipped lifejackets and since everyone agrees to paddling in groups of at least four kayaks near enough to each other that you can talk to each other, there are always other kayakers, and maybe even a lifeguard, near the person who falls in the water to paddle to them and hold their kayak to steady it while they climb back on. They all figured out how to get back into their kayak. But it would have been easier to handle this if they had practice getting back into a kayak. We offer students a chance to come down to the De Anza pool in their swimsuit, put on a lifejacket and under the watchful eye of a lifeguard, practice how to climb back in to an ocean kayak after intentionally falling out. (The De Anza pool is heated, Monterey Bay is not.) See Outdoor Club Coming Attractions for the date of the next kayaking / canoeing lessons and practice how to climb back in to an ocean kayak. 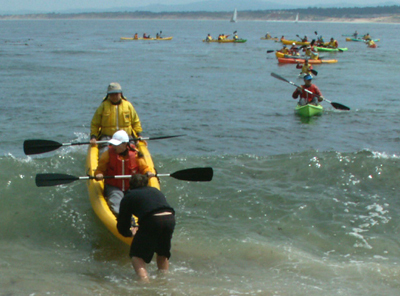 Please be on notice that the Outdoor Club will NOT be responsible for getting you back into your kayak if you fall out in the ocean during the Monterey trip. YOU will be. The Coast Guard can charge $500+ for a rescue. If you fall out of your kayak and can’t get back in, or if you go where you’re not supposed to, and end up, for example, on the rocks and need a Coast Guard boat to come get you, De Anza College will not pay for it, you will. (Except right as we launch and land, if you find yourself falling off the kayak, try to grab the kayak as you hit the water. This will mean you can climb back on faster). Quickly figure out where your paddle went and grab it or have another paddler grab it. Some of us may have swim caps with us. It could be wise to bring your own, and/or a knit hat. If you get soaked you will probably want to put on a swim cap and/or knit hat to keep yourself warmer. too many rules for you (you don’t want to stay with the group in the morning or you don’t want to wear a lifejacket) please don’t sign up for the trip. On one past trip a couple of guys came along who ignored this advice. They didn’t want to wear their lifejackets, and when the concessioner forced them to, they didn’t want to zip them up. They didn’t paddle with the group, and one argued about practically everything. They were both blacklisted by the concessioner from ever renting from them again, and likewise from any Outdoor Club event. In ’98 a woman, and in ’99 a man were blacklisted for not staying with the group, and/or not staying in the range of the kelp beds. If you fail to follow trip rules you will be reported to the college. Only currently enrolled De Anza students can go on club events. Even though Foothill is in the same district, enrollment or employment at Foothill does not qualify anyone to go with us. People who want to go on an event between quarters must have been enrolled the previous quarter, or already be enrolled in the following quarter. For example, to go on a spring break trip you need to have been enrolled winter quarter or be already enrolled in spring quarter. Faculty are subject to various rules depending on whether they are full time, ten month, part time, on sabbatical or Article 19 and should contact the club advisor well in advance of an event they want to participate in. 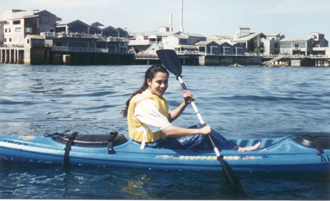 Anyone can rent a kayak from the outfitter that day, so we used to say that people could bring non-student friends and they would pay for themselves but paddle along with us. A guy on the ’99 trip invited a girl from off campus. They each had single kayaks, instead of sharing one, and she turned out to not have enough upper body strength to paddle by herself – then the guy abandoned her, and other people had to help her and tow her. More recently people brought friends who did not stay away from the animals, potentially putting everyone in danger, so we no longer allow anyone except De Anza students and faculty/staff on the event paddling with us. AND AGAIN Thinking about joining this trip? You will have more fun and even first-timers can be safe, if you understand all about this adventure. 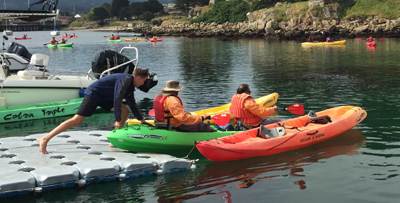 Please carefully read all this and then go to (sample trip agreement for Monterey kayaking) and read all of it, too, as signing up in person will go faster if you have read the trip agreement in advance. It could be wise to print this webpage so you have the driving directions and descriptions of what to bring. Some people turn this event into a weekend vacation and come to Monterey on the day or the afternoon before the trip and add in a tour of Big Sur, the Seventeen Mile Drive or go to the Monterey Bay Aquarium. But heavy rains / mudslides have previously closed the highway, so be sure to check before you head south from Monterey. The marine mammals we see (and hear barking loudly) on the rocks at the jetty alongside the harbor launch ramp are sea lions. 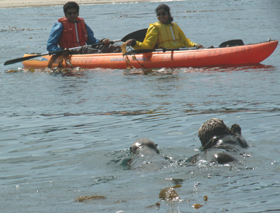 Sometimes seals get curious and swim among us. Answers to most questions about how the De Anza Outdoor club works are at: Outdoor Club Basic Info The main rules common to most of our trips, including who is eligible to go, are at: Outdoor Club trip rules . We used to launch at a beach that often had waves. When you return, wait for hand signals from the kayak outfitter personnel on the beach for when you can paddle in to shore. 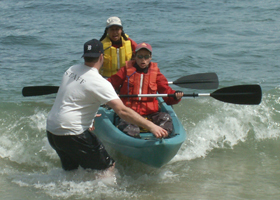 They will see when the waves are low enough to be safe, and will only let one or a few kayaks come in at a time. They might signal for you to come in a little, then wait, then finally paddle in. (IF we go out on one of the rare, foggy days with no wind and there are no waves, we can come back in on our own.) Either way, be sure to get your kayak aimed for the center of the beach so you don’t get too close to the walls of the buildings along shore. are to not follow instructions on return to the beach and run into another kayak, or to get hit by your own kayak. If a wave turns your kayak sideways when you are landing at the beach, and you are sure you are falling out, jump out towards the ocean instead of towards the beach. This way the wave will push you into the kayak (not a big problem) instead of pushing the big heavy kayak into you (and possibly breaking your legs). Trying to stand up on the kayak and surf is too dangerous. 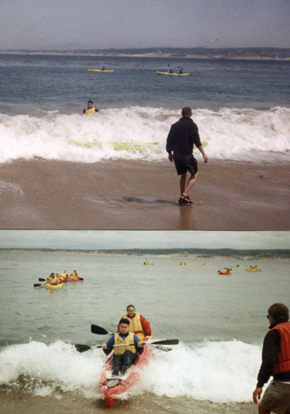 In the photo below, one guy realized he was falling out of his kayak and fell out towards the ocean side, then stood up. You can just see his yellow kayak in the surf. Below his photo are more typical slightly wet landings. but sometimes the wave has a mind of its own and you end up riding it in. The kayak outfitter we use always has an employee at the beach when we launch and when we come back in to help us, and the water is standing depth, so it’s not really dangerous. Can you see the wave starting to build up slightly behind this kayak? Despite the safety factors, it can still be a bit of a thrill when a breaking wave speeds up and seems to suddenly pick up your kayak. 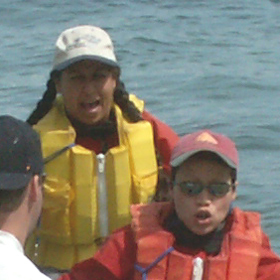 Hoang-My (Mimi) Dunkle at the bow (front) and Imelda Terrazas in the stern (rear) sum up the adventure for first time kayakers with the looks on their faces.